hanti Stupa is one of the magnificent Tibetan structures that has ever been built. The architecture and the beauty of this place are unexplainable. 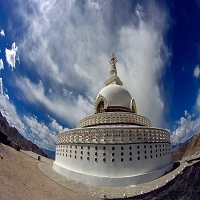 Shanti Stupa is a white-dome structure dedicated to Buddhism. This brilliant structure stands atop a steep hilltop at a dizzying height of 11,841 feet above sea level. This dominating altitude of the Stupa allows it to offer picturesque views of its beautiful surroundings and hence, draws the attention of thousands of tourists every year. Facing towards the Leh Palace, the stupa overlooks the entire vibrant and colourful city of Leh and offers panoramic views of the Changspa village too. The beauty of Shanti Stupa takes a level up at night, especially during the full moon night when it is naturally illuminated by the moonlight.